Thai Boat noodles (kwaytiao reua) are a delicious and intensely flavoured but little known traditional Thai dish. They are associated with central Thailand, and are so called because they used to be sold from small boats along the canals and rivers. These days the vendors have moved onshore and the most famous boat noodle restaurants are found in 'boat noodle' alley near the Victory Monument in Bangkok. We visited 'boat noodle' alley when we were in Thailand last year and that's where my infatuation began… From pretty much the day we returned I have been methodically preparing to cook Thai Boat Noodles, there has been lots of researching recipes and searching out ingredients but finally on Saturday it all came together and I successfully cooked my first batch of Thai Boat Noodles. The hardest part is of course the broth, after hours of boiling and simmering and adjusting seasonings I was really pleased with the final taste of my broth. It was luscious and rich with strong notes of beef and undertones of cinnamon, star anise and chinese five spice and an overall well balanced salinity and sweetness. Unfortunately I don't read Thai so my research has been limited to English descriptions of this wonderful and unique Thai dish. I have tried most of the versions of Thai Boat Noodles that are available in Melbourne, you can read about them in my previous post. 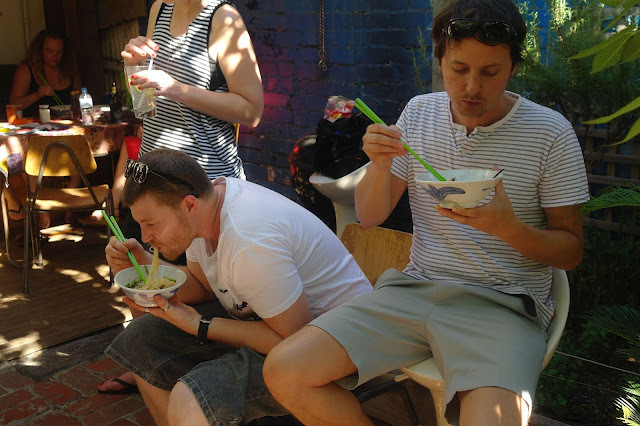 While I have really enjoyed the different versions that I tried in Melbourne, none have really matched the noodles I ate in 'boat noodle' alley in Bangkok. Firstly, 'boat noodle' alley serve much smaller bowls and customers are expected to eat multiple bowls to fill their stomachs. Perhaps this could be considered somewhat gimmicky and certainly doesn't seem traditional but I really liked the concept and judging by how busy the 'boat noodle' alley restaurants are, so do the Thai. Secondly the construction of the dish is somewhat simplified, the main difference being that there is no stewed beef shank. The construction is simply, a pork ball, a few shreds of tender steak, some morning glory, rice noodles and of course that delicious broth. I have reached the conclusion that this is a modern, dare I say it 'fast food' Bangkok style interpretation of a traditional dish, and it's wonderful! 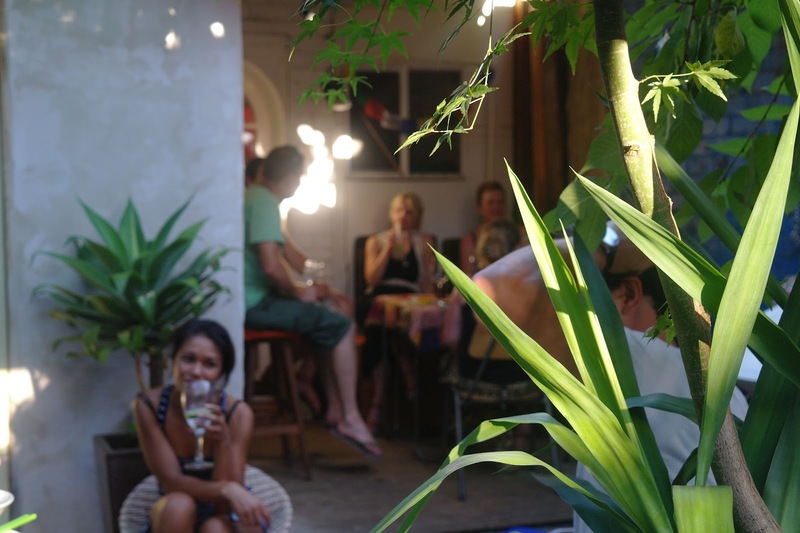 It is this Bangkok version that I attempted to make in my backyard on Saturday. 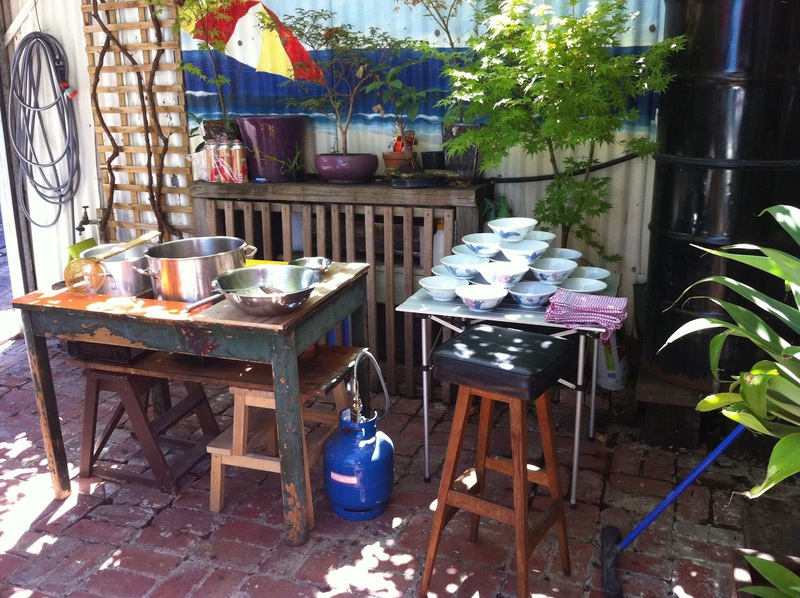 I have a dream of launching a Thai Boat Noodle Pop Up Street Food Cart in Melbourne. It's a bit of a crazy dream but I have a passion for Thai street food and a passion for Melbourne so somehow in my mind it fits perfectly. 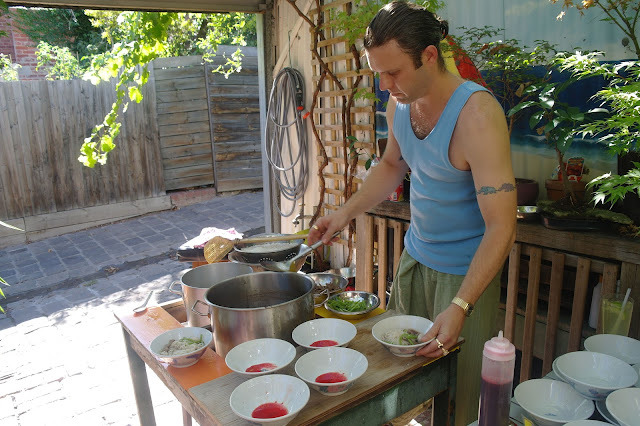 For me its not really about money, its all about the love of Thai street food and hopefully a bit of fun (or as the Thai say, sanuk). So obviously the first step towards achieving my dream was to actually cook the dish I hope to one day be spruiking around the streets of Melbourne. I took great inspiration from the stories Luke Nguyen and his sister tell in their respective cookbooks about their father endlessly toiling away perfecting his now famous Pho recipe and obviously fostering a passion in Luke that has helped him to become such a great ambassador for Vietnamese cuisine and in turn empowering me to explore my food passion also. 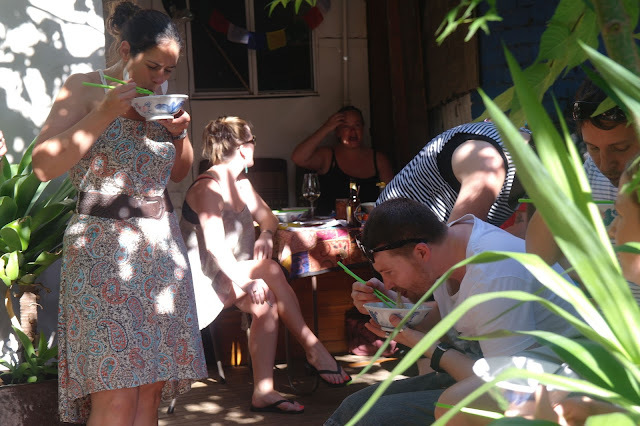 As these noodle soups require you to cook such large batches (about 15 litres actually) I decided to invite a group of friends around to sample my first effort so that I could cook it in the most authentic way possible. It was also a great opportunity to bring everyone together and at the same time get some feedback on what they thought. 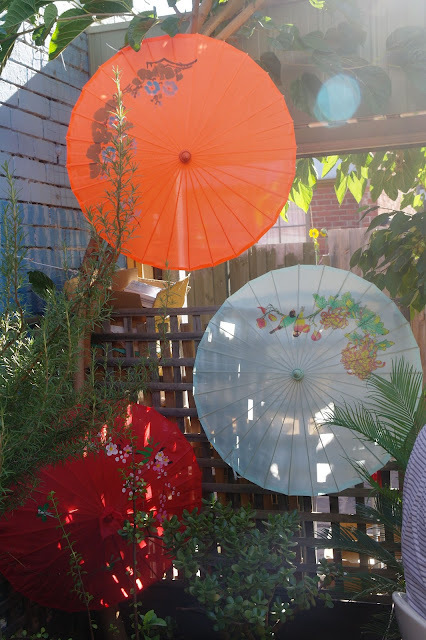 To try and make it feel that bit more authentic I built a bit of a makeshift noodle cart from an old table and Tina decorated the backyard with some asian lanterns and umbrellas. I thought my noodle cart was pretty cool and certainly functioned well on the day but I'm definitely excited about having a proper cart built! I'm not sure how easy that is going to be but it is Melbourne so there is sure to be someone somewhere how can help. If you know anyone, please let me know! The final bowl count was just under 50 bowls which I thought was a pretty good effort. It was helped considerably by my friends Luke and Rupert who took in on themselves to go head to head in battle. Lukey (below left) was the victor and now holds the record with a whopping 11 bowls!!! Rupert wasn't that far behind with an impressive 9 bowls although both of them were definitely the worse for wear and it was only after they both attempted to walk it off with a couple of laps around the block that they started to come good again... Great effort boys, I really appreciated your enthusiasm. 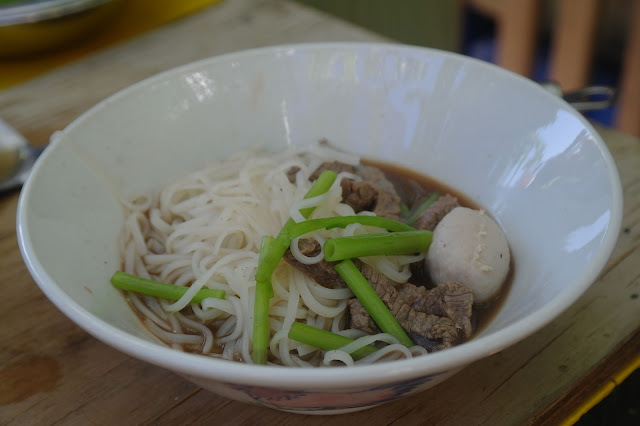 One of my favourite descriptions of Thai Boat noodles is that it is a joyous union of Chinese beef noodle soup and Vietnamese Pho, From the Chinese beef noodle soup you have the prominent usage of five spice powder, star anise and cinnamon sticks in a dark soy sauce-tained broth. From the Vietnamese Pho you have the use of the braised beef bones stock, tender slices of beef and of course the rice noodles. 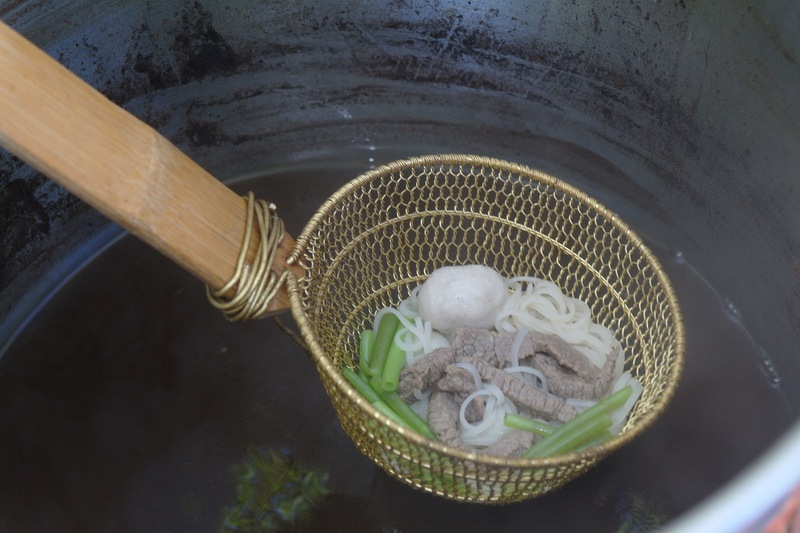 One of the special differences from these two classic noodle soups is the use of pig's blood as a thickener. It adds a lovely richness to the consistency of the final soup. Many of my friends asked what the special red sauce was, however I decided to keep this a secret until everyone had had the chance to try it without letting their experience be tainted by the psychological impact of knowing you are are eating blood. When I finally came clean I was a bit surprised that no-one really seemed too bothered about it at all! One of the other things that I really like about the Thai way of serving noodle soup is that the diner is provided with a standard set of seasonings which are used to adjust the balance of flavours to your own personal preference. Typically on each table are four seasonings, fish sauce, crushed dried chillies, white sugar and sliced fresh chillies in vinegar. Some people are against self seasoning but I love being able to beef up the sweetness or chilli with a few sprinkles of this or that. 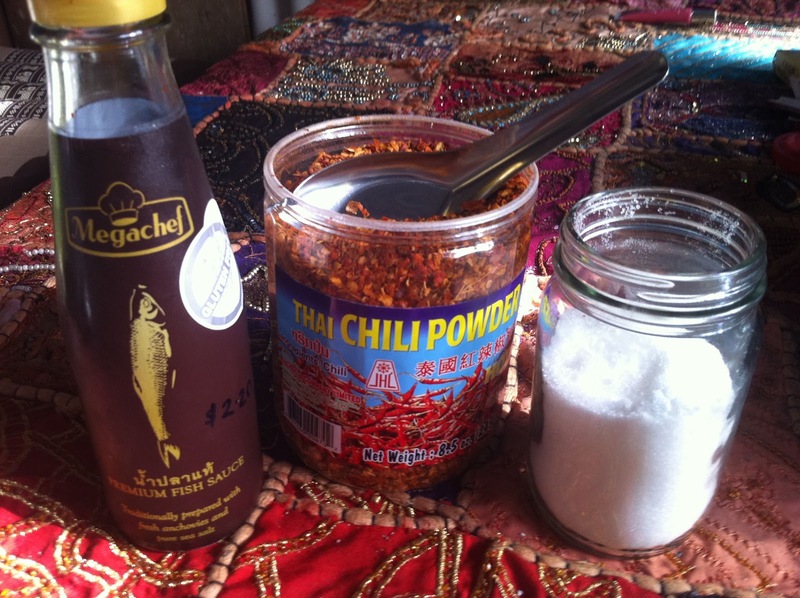 My preference is for a splash of fish sauce, a sprinkle of sugar and a nice spoonful of dried chilli. 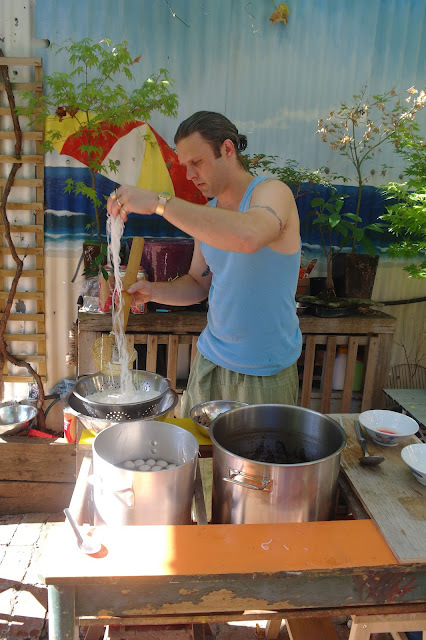 So a big thankyou to all of my friends who shared in my first effort at cooking Thai Boat Noodles. I had a great time and was very happy with how everything worked out. Since we came back from Thailand I have been watching Andy slowly pull together his dream of having a boat noodle cart. To be honest - at first I thought it was a bit of a random and crazy idea, but I do have a soft spot for random, crazy ideas so I was definitely in. It has taken Andy several months of research, shopping and planning to get to today and I must say he pulled it off in spectacular fashion! The noodles were extremely yummy - they looked so beautiful in the bowl, you just could not wait to tuck in. The broth was so full of flavour, the mix of the star anise and cinnamon was very delicious and created such an interesting and very moorish flavour. The noodles were cooked beautifully, the rump was so lovely and tender, and I am a huge fan of morning glory - it adds a such lovely crunch and freshness! I was also really excited to hear my friends commenting on how delicious the noodles were, they all seemed to love the flavour of the broth all picking out ingredients and commenting on how much they liked the combination of flavours. Of course the proof is always in the eating and it was so excellent to see everyone going back for seconds and thirds! Congratulations Andy, looks like it was a highly successful event. Your boat noodles look delicious. I loved the way you stacked the bowls into a pyramid, just the way the do at boat noodle alley in Bangkok! Thankyou Mark, I was trying for as authentic an experience as possible! Looks fabulous!!!!! Love it all, the noodles, the cart, the umbrellas!! Wish we could have been there, count us in for round 2! Thanks guys, yes I'm really hoping you can make it next time! Hopefully famous for good reasons!